As a first responder to fire emergencies, you know that every second counts. 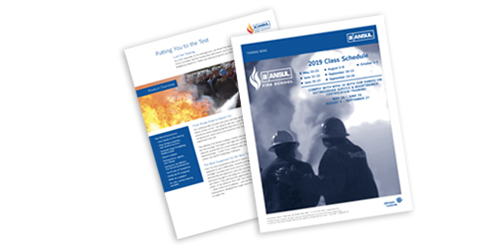 The ANSUL® Fire School provides real-life training that will prepare you to confidently respond to high-pressure firefighting situations. Three-day training programs are offered May through October. Our professionally-trained instructors will help students understand the science, technology and theory of fire control. Our experts will also cover fire extinguisher inspection and maintenance procedures while emphasizing the importance of regular service. Students will learn how to recognize and report abnormal conditions that may hinder performance and how to recharge the equipment they use. The ANSUL Fire School employs a three-step learning system of fire knowledge, classroom and live fire training. Participants will fight over 20 fires, including unconfined spills, fuel-in-depth, obstacle, gravity fed and pressurized gas and liquid fires. The 27‑acre fire grounds provide a variety of industrial props – tanker truck, propane jets, paint locker, overhead flange and others – that help create real-world firefighting challenges. Even the best equipment in the world needs trained operators to use it effectively. Students will fight fires using cartridge-operated and stored pressure fire extinguishers, wheeled fire extinguishers, hose line apparatus and various extinguishing agents including dry chemicals, carbon dioxide, foam and others. They will have the opportunity to wield the power of our premium RED LINE Hand Portable Extinguishers – often a first line of defence – and our RED LINE Wheeled Extinguishers, designed for single-operator, rapid response to large fires. For full details and enrolment forms, download the documents below. Please take a minute to fill in the details below to contact our training team to receive news and updates about the ANSUL Fire School.